Here is an article on MUAC and weight change during treatment for SAM. even overlaid onto a weight growth chart). an addition for MUAC would be valuable, if readily feasible. I had not thought of using a MUAC chart as you would a weight-for-age growth chart in (e.g.) 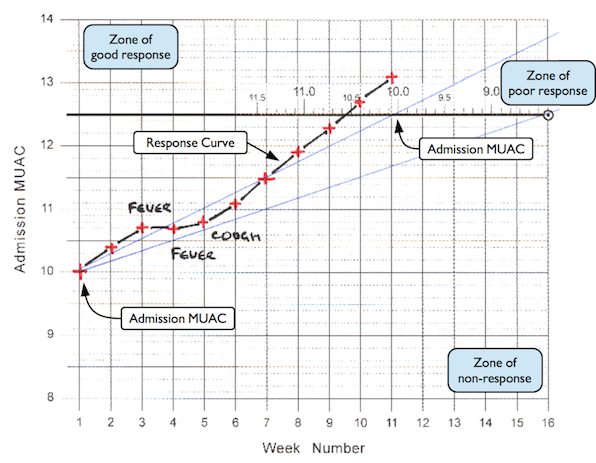 a growth monitoring program (GMP). we have had considerable success using MUAC in an integrated GMP and CMAM program. In this program we measured MUAC and admit on a single MUAC threshold and watch-listed based on proximity to that threshold. This has proved feasible. I think the main issue with using MUAC for GMP is that MUAC does not change very much or very rapidly with age after about 12 months of age. There is a lot going on in terms of the composition of the upper arm, tissue mass increases over time with increasing limb-length in children that are not stunting or stunted, but MUAC does not increase very much very rapidly. The fear is that (e.g.) monthly monitoring might not be very sensitive to detect faltering. I think that the best approach would be to do SAM and MAM case-finding using MUAC within GMP programs. I think that the best people to lead the design work might be clinical staff with experience in HDU / ICU experience as they will have much experience in monitoring tools and algorithms. Replacing weight monitoring with MUAC monitoring will allow further decentralisation of CMAM services (e.g. to be delivered by CHWs). I think, with careful design, we could develop a tool that could be safely used by CHWs with limited letter and number skills. Thank you really this can answer the Question.thanks ones again. Many thanks for your prompt and valuable reply. I like your chart! You have raised some important issues. When we reviewed DHS and other data in the late 80’s, growth faltering started as early as 3 to 4 months of age, reflecting absent or inappropriate breastfeeding. Monitoring in infants might be useful to identify SAM at an earlier age. Obviously, the situation is different in emergencies as compared elsewhere. Sometime back, I designed a tape that might be useful for individual children to be monitored. It might be possible that a widened lightly colour-coded tape (2 cm) itself (or a copy) could become a chart at least for the first 12 months. Regards and best wishes for the New Year to All. (1) The chart does work well on the population in which it was developed but it does need calibration and further testing. A key issue with this is that this type of chart requires some number skills that cannot be taken for granted when working with CHWs in some settings. This may limit its use. It would work OK with an integrated GMP and CMAM program (as done by SC-US and Tufts in Bangladesh) as the GMP workers do have the relevant skills ... but they can monitor response using weight anyway. I think the longitudinal strap might be a better bet in such settings. (2) I do not doubt that growth faltering starts early but I do not think that DHS is a good tool to detect this because of (a) poor data quality and (b) faltering is a process and a cross-sectional survey cannot detect a process only the outcomes of processes. That said, there has been some interesting work from the Kilifi team on MUAC in children aged < 6 months. (3) I think the work done by ALIMA under the heading "MUAC = Mothers Understand And Can use it" (something like that) and in the nascent MUAC bangle / bracelet work by ACF. This work is all about mothers using MUAC classification devices. The approach shows a lot of promise. ALIMA has a second paper in preparation. in an iCCM (CMAM by CHWs) program. MSF are working with others to produce broad (2.5 cm) straps. Happy New Year! Thanks Mark for sharing the paper. That's quite useful as we are trying to develop a simplified tool to monitor children under treatment from admission to discharge that does not require literacy or numeracy as part of the iCCM program. Just to give a brief update on the tool you mentioned, this was inspired by your work, Fred (AJCN 1975) on the use of a longitudinal MUAC (thanks Mark for sharing his paper with us!). Over the last year, we have gone through several iterations (the tool you showed was an early version) and are currently working with the organization Quicksand, which is currently field testing several prototypes with end users. We'll begin our next field test this month and hope to write up and share our experience soon. We're looking forward to sharing and piloting these tools with our friends in the nutrition community, especially under the iCCM and nutrition sub-working group. We also have research plans in the works in partnership with UNICEF and JHU on the effectiveness of this simplified toolkit by low-literate iCCM community health workers. If anyone is working on something similar, it would be great to hear from you! in a 5 Jan 2016, note. Would be interested in the outcomes and any further progress. Sorry for the delay, but would like to be involved, including reference to mothers.